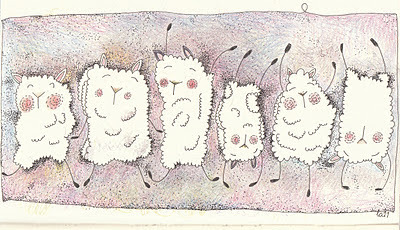 why there are six happy dancing sheep here today? 5.10.2005! Siinä syy tanssiin. Kiva kun olet näin kauan pitänyt ihanaa blogiasi. Toivottavasti pidät vielä kauan! Well I was going to guess that you found a tassel to your liking but reading the other comments gave the real reason away. Happy blogaversary! 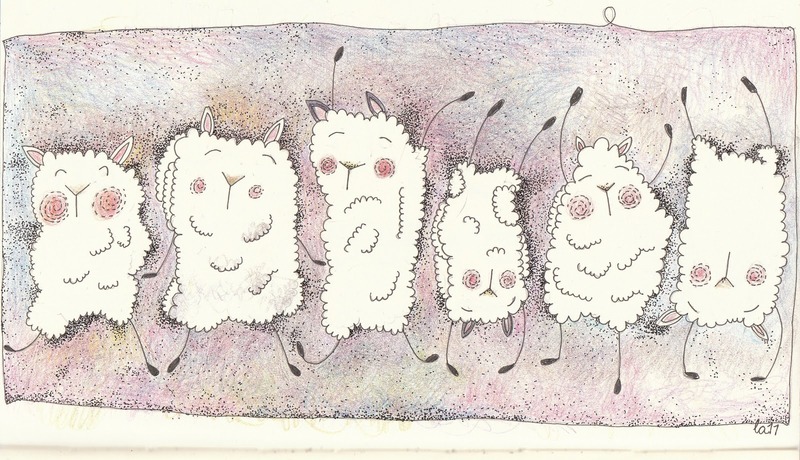 I always check your blog, not just for the knitting, but for the lovely drawings! Have you ever illustrated for a children's book or been published? I find the sketches delightful! Congrats! And someone needs to get you to make a book! Your drawings are fantastic!!!!!! Love the drawing. Happy blogiversary. happy blog birthday! I just love reading and admiring your beautiful knitted creations! I've enjoyed your blog almost since you've started it. I appreciate the effort you put into your projects, the photos of same and the care you put into describing your thoughts and surroundings. Happy Birthday to the blog. I've enjoyed reading off and on for a few years. It's always a pleasure. Happy Blog Birthday!! I think I have read every post, and loved them all. Wishing for many more! Congratulations!! !Happy blogiversary!!! Your blog is wonderfull! I love your blog. It is so inspiring. Happy blogaversary! Thank you for sharing your art and your part of the world with us. And please keep right on doing so! I love your blog,Thank you. Guess I just love your blog!! May you blog for many years to come! you are a highlight of my day. Your drawings have a style which I find very appealing. Thank you for the pleasure you give by writng your blog - I haven't been reading as long as that but am always thrilled when there is a new post. Your drawings, knitting, writing are full of joy. Congratulations, all good things to you and yours. I just lovethe things you knit, but the most I love the birds that you paint. I love all birds,they make me happy. is it possible to buy a birdpaiting from you ? Congratulations, and thanks for the pleasure your writing, art, and designing have brought me for six years. I look forward to what the next years will bring. Thank you for all the wonderfully inspiring posts! Thank you for taking the time, I have really appreciated them! Happy 6th Blog Birthday - can it already be six years? I've loved reading your blog since shortly after you began: your little birds, pulla bread, the Finnish lessons, and all that you've shared of your life and wisdom with wool. It is a pleasure to read your posts, look the beautiful pictures of your knitting, drawing, dogs and cat and the serene beautiful surroundings you live in. Thank you for sharing it all with us. I too would be happy if you published anything...knitting, photos drawings...even Finnish lessons. Congratulations Lene. I hope you blog many many more. Love reading about your knitting, dogs, cats, nature, sketches and your beautiful way with words. Then I read the other comments, and see that it is your 6th blogiversary - wow! Congratulations! Happy Blog Birthday from Germany! Oh, congratulations from me as well! -Keep up the wonderful work ...and blog! I don't often comment, but I love you blog, read regularly, and ALWAYS enjoy! I, too, love your drawings! I love your writing and illustrations - you truly have many gifts to share! Congratulations on six wonderful years - please don't stop! Happy Blogiversary! i love your blog. I come here often to check out what you are knitting, but also to enjoy the illustrations, the photography, and your beautiful and unique voice. Thank you very much for sharing it with us all. I save your blog to read on days when a treat is in order, so just discovered the Oct 5th post - happy belated blogaversary! And thank you for being my special treat on many a grey day!